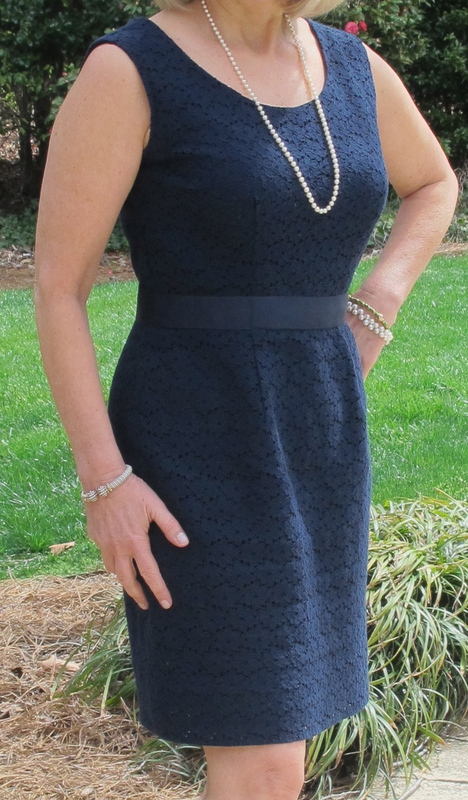 While Tory Burch may refer to her Ginevra dress as the little lace sundress in the classic shade of navy, I’m calling my new navy lace dress my Easter dress, and it better warm up or I’m in trouble. This is my completed project for the Mood Sewing Network lace challenge and I must say I’m pleased. and was set to go until I saw – and touched the actual dress in a store. I suddenly lost confidence fearing I could never make a dress that favorably compared to it…. Thank you, Readers and thank you Lynda Maynard’s online Craftsy Course, Sew the Perfect Fit. for moving me past my apprehension! Since this was my first experience to sew with lace, I vowed to limit the risk factors by selecting an easy to work with lace, keeping the project simple and sewing a familiar garment style. The cotton lace was a delight on many levels. 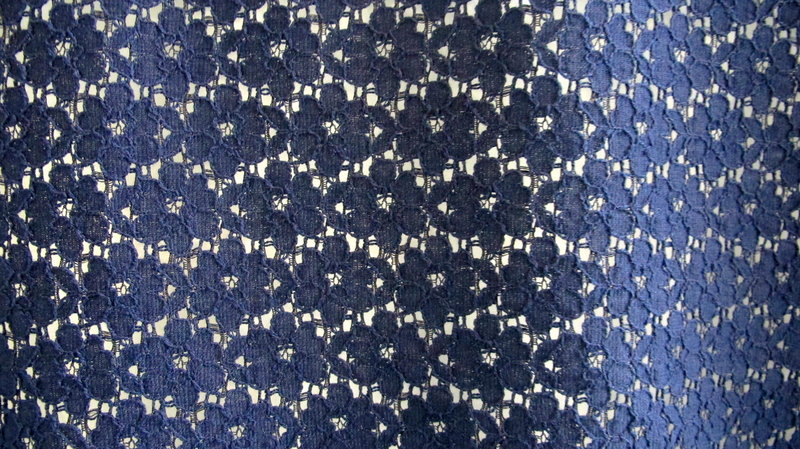 Hand stitching and tracing paper marks disappeared into the sea of navy flowers. 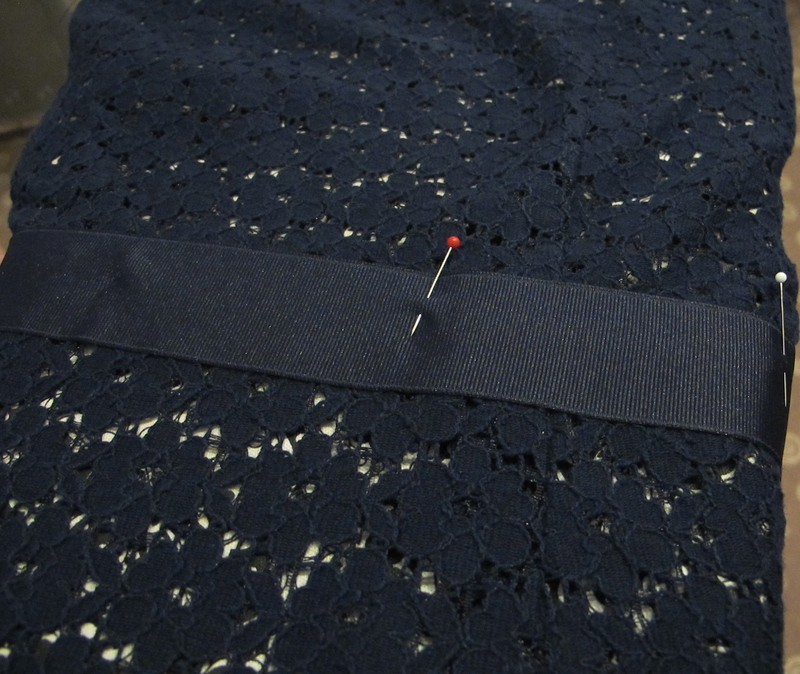 The fabric has good body and held up well when I attached the grosgrain waistband and inserted a hand-picked zipper. My only surprise lay in discovering how easily lace can stretch. Fortunately stay-stitching the edges solved the issue. The dress is lined with a navy china silk from Mood Fabrics. I used an older Milly cotton lace dress for reference and decided underlining was unnecessary for this fabric. Since all of my adjustments were made in the muslin the sewing went quickly and a new dress was born!